See The Magician plate - a rare find! Freedom from Fear by Gorham - a Rockwell classic! 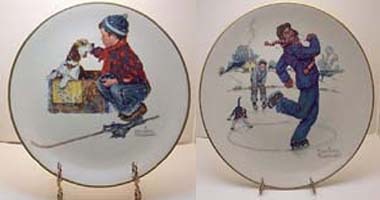 We have over 500 different Norman Rockwell plates issued by a variety of plate makers. 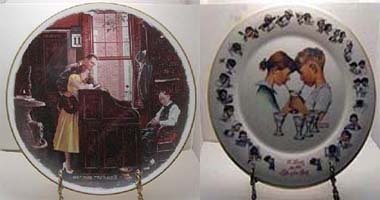 Many of Rockwell's original works, including paintings, magazine covers and illustrations have been produced in the form of collector plates. We are celebrating the Winter Season with a beautiful selection of Rockwell images. We invite you to browse some of our favorites. 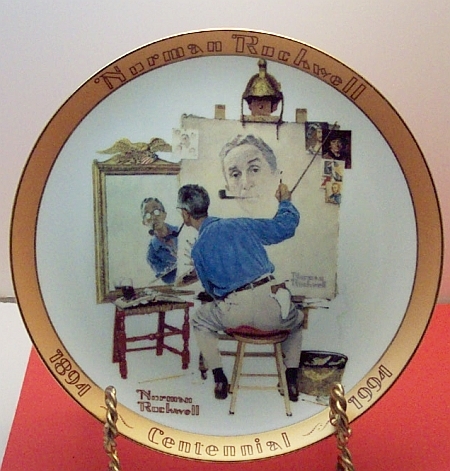 As always, we suggest using our Sitemap/Search page to browse all of our Rockwell Plate titles. We invite you to visit all of our online storefronts. Our primary storefront is Mamie's Rich Memories but be sure to visit our "specialty shops" including The Kitchen Hutch and Faces of a Lady. We are expanding! 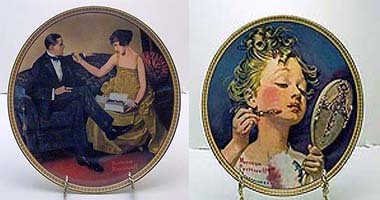 Look for Rockwell figurines, Plates framed in Shadow Boxes, vintage magazines and covers too. Ready to Browse and Enjoy Memories from a Very Special Artist? Welcome to RockwellPlates.com. We are excited to add this specialty site to our company, Mamie's Rich Memories. As you browse the various plate collections, we think you'll agree that this wonderful artwork has an important place in our everyday lives. 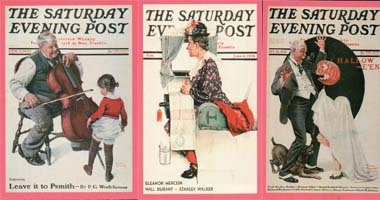 Rockwell artwork mirrors our lives with memories of the past, perceptions of the present, and peeks at our future. His work is truly timeless. We are now stocking a limited supply of Norman Rockwell porcelain figurines from various makers including Gorham, Dave Grossman, The Danbury Mint, Royal Manor and The Norman Rockwell Museum. 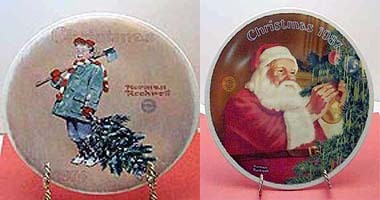 These make wonderful gifts and display very well when paired with a matching Rockwell plate. 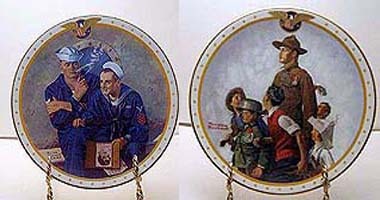 Other Rockwell enthusiasts collect by themes or images such as Christmas images, Scouting, Grandmas and Grandpas, Moms and Dads, landscapes, children, and military themes. 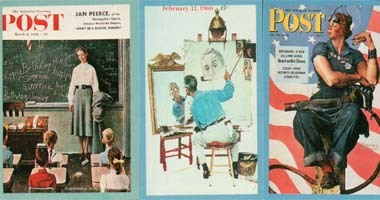 We hope you will take the opportunity to browse the collections listed here and enjoy the art of Rockwell. 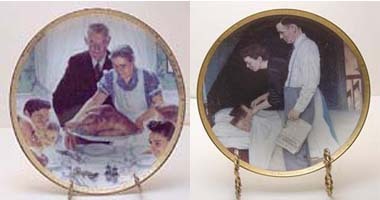 All of our Rockwell collector plates are in mint condition. We do not sell damaged or abused plates... in addition, most of the plates offered are in plate boxes with the original paperwork and certificates of authenticity (where issued). Any exceptions are clearly noted. Since most of the Rockwell issues are now retired from production, many of our plates are preowned but we guarantee not only the authenticity of each plate but excellent condition too. Some boxes show slight wear from storage but all plates are excellent. We occasionally sell "just plates" with no boxes or certificates. All of these are also in excellent condition but missing paperwork/boxes. The price of a plate is reduced so if you "just want the plate" be sure to check our inventory under the plate name. These offerings are limited and change frequently. 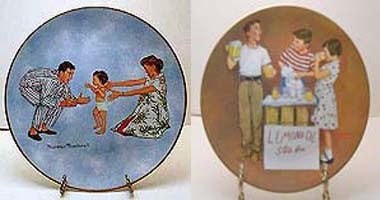 In addition, we are now offering a creative way to display your Rockwell plates. We are framing plates in wood shadow boxes with glass. The plate will be shipped securely in a shadow box (no collector plate box/or certificate). These make very thoughtful and unqiue gifts and will create a unique piece of art in your home. Our prices are very fair and below market value. We offer good deals and combined shipping for multiple purchases. 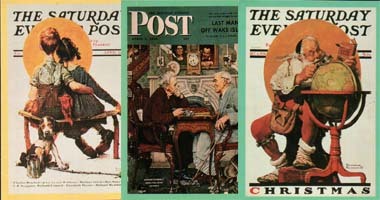 Our clients are many... Norman Rockwell collectors, collectibles dealers and decorators too! Purchasing is easy at Mamie's. We accept checks, money orders, credit cards, debit cards and e-checks. We use PayPal as our secure shopping cart but you do not need to be a member of PayPal to order. PayPal will verify and authorize your credit or debit purchase and validate the order with us. Your information will always be private and secure with PayPal and as an added security feature, we do not retain any credit information in our order fulfillment system. We want you to be satisfied with every purchase. Upon receiving your order, please check over each item and if you're not satisfied, we'll accept any return within seven (7) days of receipt. Let us know that you're shipping the order back and we'll promptly refund your payment. Shipping is not refundable. We ship either FedEx Ground insured or USPS Priority insured depending upon weight and distance. Your items will be securely packed and in most cases we ship within 48 hours of your purchase..
We are happy to ship internationally and generally ship via Priority International insured. If possible, we will ship first-class international to save you money. Express shipping is also an option. Upon ordering, our shipping calculator provides shipping costs for orders to Canada and the United Kingdom. Due to varying rates for other countries, we ask that you contact us prior to ordering so that we may customize the rate for your order. 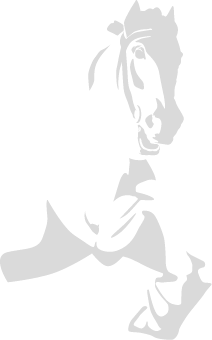 Please email us and we'll get back to you right away with calculated rates. We hope you will find our shop an interesting place to browse and we thank you in advance for shopping with us. 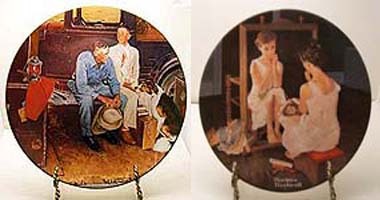 Our inventory of Rockwell collector plates is extensive and we continue to add related Rockwell products as we find them. Thanks for visiting and we hope to see you again soon. Copyright 1990-2019 rockwellplates.com. A specialty site of Mamie's Rich Memories. All Rights Reserved.